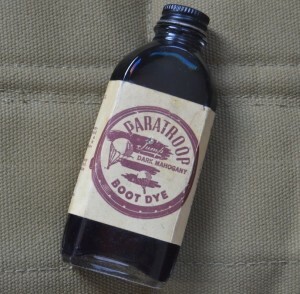 I was familiar with the tins of black paratrooper boot polish, also by Corcoran, but I had never seen one of these before until I ran into one this month. It is a small bottle with brown liquid boot dye and has the Corcoran brand. Corcoran is the best known manufacturer of the famous lace-up paratrooper boots. The label is not dated, so I am not sure if these are war-time, or early post war. But a neat paratrooper item anyway!